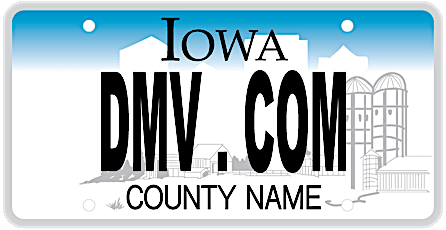 DMV.com was created to help simplify your life by providing you with all the vehicle related information and Iowa DMV services you may need, in one place. Quickly find information and services regarding driving records, vehicle registration, drivers license renewal, license plate renewal, getting a learners permit, and finding a Iowa Department of Motor Vehicles approved traffic school. An Iowa drivers license is required to drive legally in the state. Discover the IA drivers license services offered by the DOT. Access your IA DMV driving history without leaving home. Ordering your IA driving records online is the most convenient way to request them. Get the car insurance coverage required by the IA DMV. Our Iowa online auto insurance center lets you compare car insurance rates easily. An IA driver improvement course enables drivers to receive insurance discounts. Discover how IA online traffic school maximizes convenience. Take an Iowa DMV practice exam online to gauge your driving knowledge. An IA driver practice test helps you to prepare for the license exam. Vehicle registration services in Iowa are provided by the DOT. Learn how to renew car registration documents in IA quickly and easily. Iowa drivers education is required by the DOT for new drivers who are younger than 18. Learn about IA drivers ed guidelines and benefits. An IA DMV bill of sale is an important receipt to obtain after you buy or sell a car. Learn how to get a bill of sale form from the Iowa DMV. Drivers must respond to traffic tickets in Iowa to avoid penalties from the DMV. Learn how to pay a ticket online quickly and easily today. Getting a DWI in IA results in automatic license revocation by the DOT. Learn more about DWI laws and DWI consequences in Iowa. Purchase a car online in IA for a simple car-buying experience. Buying a car online expedites your DOT new car registration process. DMV locations are available throughout Iowa. Find a nearby Iowa DMV office where you can obtain the DMV services you need. We proudly present you the guide to the Iowa Department of Transportation. If you’re searching for the quickest way to find info about the Iowa DMV – stop, as you have found it. DMV.com is a website that has a mission to provide its readers with the most accurate and most detailed information. All Iowa’s requirements on getting a new IA driver’s license or forms you need to fill out for vehicle registration, are covered in our articles. The latest info on license and registration renewal/replacement, auto insurance, DUI information and more, is included here too. The website functions independently and is not connected with any government agency, thus dealing with the boring DOT’s bureaucracy is out of question. Here you can find your desired info very fast, just use the “search” bar at the top of the page or the navigation sections at the bottom. Our readers too, are more than welcome to contribute to our website. You can comment our pages, provide us your feedback, rate automotive business and join us on Facebook as well. With your help, we’ll be better able to offer the latest information at any time.